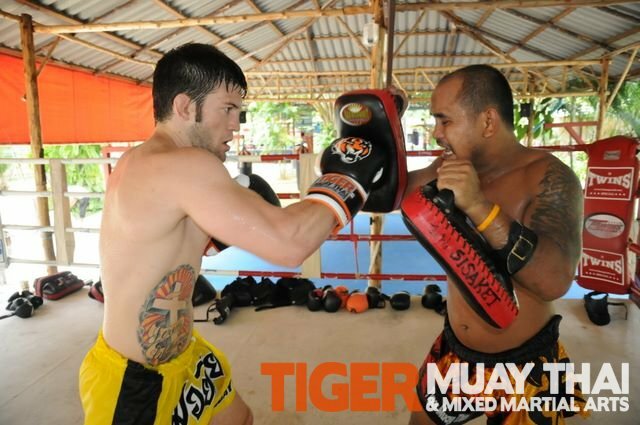 JJ Ambrose is a Brazilian Jiu Jitsu Brown Belt and head wrestling instructor at Tiger Muay Thai and MMA Phuket. Currently 16-3 as a professional, Ambrose recently signed a 3 fight deal with one of the leading Mixed Martial Arts promotions in the Pan-Pacific/Southeast Asia regions, the Pacific X- treme Combat league. Fighting against french MMA specialist Sebastien Garguier, Ambrose will have his work cut out for him. Garguier is a veteran of over 15 professional fights and has already competed 4 times in 2011. With a win against Garguier, Ambrose will position himself one step closer to the PXC Lightweight Championship–and hopefully a call from one of the major MMA promotions. With a strong performance Oct 29th at the University of Guam Field House, expect to see JJ Ambrose compete for the promotion again Nov, 26th when they head to Resorts World Manila, Philippines.